Northern Nights is proud to be the West Coast’s premier boutique camping festival! Remember to keep your camp clean! Camping opens at 10AM Friday July 14th. FREE Riverfront Camping is just what it sounds like. 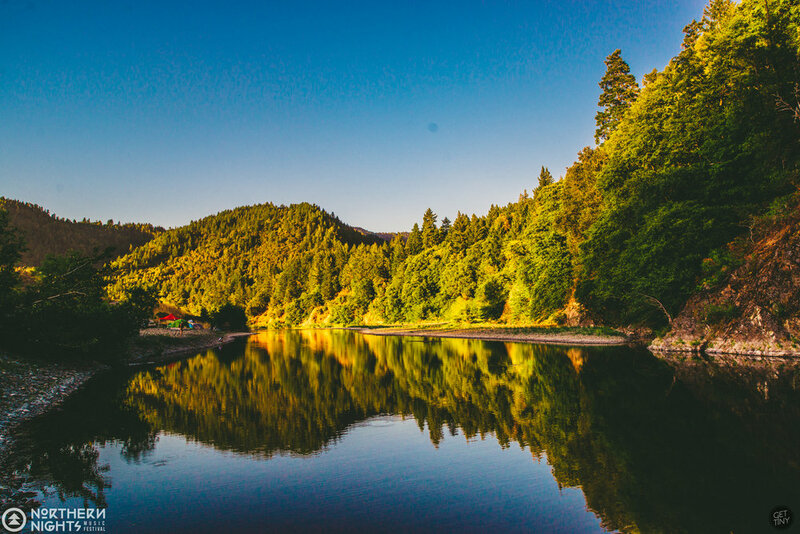 Imagine camping on the river bar and waking up just a stones throw from the Eel River! Riverfront Camping is ideal for groups and camps requiring more space. This is the place to set up a “living room”, teepee, or spaces to share with campmates. Prepare for Riverfront Camping with additional shade structures and mattress padding for your tent. The extra space to spread out is worth it! Please respect the River by keeping it clean, and don’t leave anything behind when you pack up! FREE Redwood Camping is extremely limited and works on a first-come, first-serve basis. Pitching your tent in the Redwood Grove is ideal for campers who wish to have natural shade provided by super-duper tall Redwood trees that smell amazing. Campsites are limited to a 10ft x 10ft size, and communal camp areas are not allowed. UPGRADE to Reserved Redwood Camping and reserve your very own 10ft x 10ft spot. Travel to Northern Nights stress-free knowing a place to pitch your tent is waiting patiently for your arrival. You must bring your own tent and camping supplies. You may request to group multiple reservations together so you can camp with your friends. Reserved Redwood Camping is extremely limited and will sell out, so if this sounds like your dream camping situation, reserve your spot now! 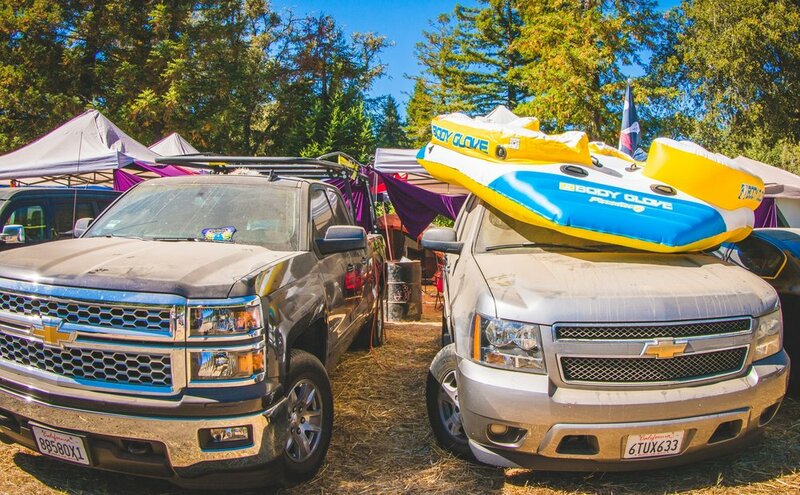 UPGRADE to Car Camping and enjoy easy access to your car and belongings all weekend. This is the only way to camp with your car! You will have 10ft x 20ft space for your vehicle and campsite. Your car and campsite must fit in the designated space. Arrive together and camp together! No saving spots. To upgrade to car camping click here. UPGRADE to 4×4 Truck Camping (must have 4 wheel drive) and minimize the distance from your car to the campgrounds. You will have 10ft x 20ft space for your vehicle and campsite at a discounted rate from car camping. To upgrade to 4x4 Camping click here. UPGRADE to RV Camping and reserve your 10ft x 30ft space for an RV and campsite. RV, Campsite, Tow Vehicles, etc. must fit within the designated 10ft x 30ft space. RV hooks-ups are NOT available on site. Arrive together and camp together! No saving spots. To upgrade to RV Camping click here. Northern Nights has teamed up with JUCY to offer NN17 attendees the access to JUCY Camper Vans at a special rate for the festival weekend. The package includes a ton of free inclusions for the weekend. Their sweet deal includes 4-night van rental, express entry into the festival, basic insurance, 100 miles a day free, bedding kit for two and the kitchen kit for only $599. Their van sleeps four so that’s only $150 each for your comfort. As an early bird special, JUCY are throwing in free early bird pick up and late drop off (saving $110) if you book your van in before March 31st 2107. Northern Nights ticket sold separately. BONUS EARLYBIRD SPECIAL – Book before March 31st to get FREE early bird pick up and late drop off worth $110! 2 AO Camp Wristbands giving you access to Lounge Tent - Games, Camp Grill, H2O (Hot & Breezy), Goodies & Lounge! 4 AO Camp Wristbands giving you access to Lounge Tent - Games, Camp Grill, H2O (Hot & Breezy), Goodies & Lounge!